Michael had always wanted to capture the complete sound made by live musical performances, including the acoustic of the space in which the performance took place. At an early stage I recall being surprised to discover that the sound of an orchestra heard outside the auditorium through a closed door sounded much more spacious and realistic than commercial stereo recordings heard via two loudspeakers! In 1970, there was great interest in quadraphonic (four-channel) sound reproduction, and it was assumed that four channels were necessary to reproduce true ‘surround sound’. Michael tested this assumption by designing a system for playing two-channel recordings over four loudspeakers to find out if a surround-sound effect could be obtained. He proposed a ‘sum-and-difference’ technique in which the left-hand speaker was fed with the left stereo channel, the right-hand speaker with the right stereo channel, the front speaker with the sum of the two stereo channels, and the rear speaker with the difference ‘between’ the two stereo channels. 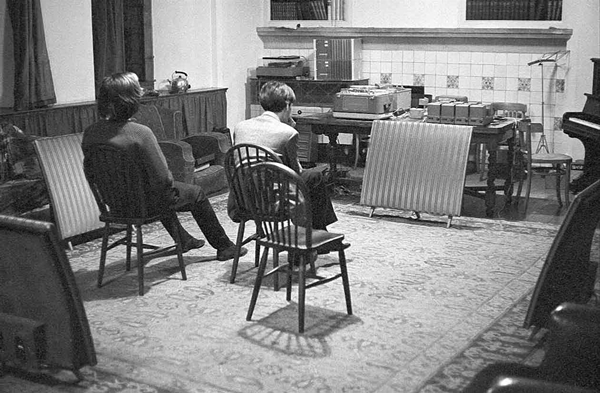 Four-speaker layout viewed from the rear, with Philip (left) and Michael. Four Quad Electrostatic loudspeakers were fed by two Quad 22 control units and four Quad II valve amplifiers. Tapes were played on Revox F36HS and Revox 736 tape recorders. Note the pair of two-channel Dolby A301s at the far end of the room. These had been collected for evaluation from Dolbylabs on the same day that these photos were taken: see ‘The Dolby Experience’. Once we’d got the [speaker] placement and volumes right, the effect was remarkable in giving greater presence, clarity and impact. But it also highlighted recording defects such as drop-outs, hiss, modulation noise, high-frequency overload and sibilant distortion, all because it was so much more realistic that the faults brought one up with a jolt to realise it was only a recording. The results were very successful on Purcell’s Ode to St Cecilia in the reverberant acoustic of Merton College Chapel [C236/678], but less so on a concert recorded in the drier acoustic of the Sheldonian Theatre, when the image was displaced, at least when not sitting in the central seat (occupied by Michael in the photos). Even so, the treble seemed much better than in ordinary stereo. 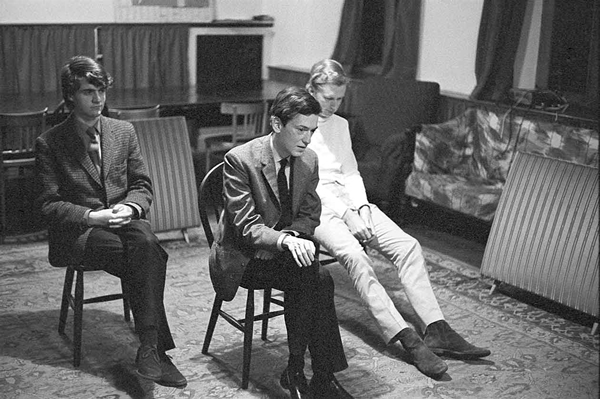 We had previously found that it was not possible to play our recordings at a realistic sound level in Pusey House Common Room without overloading the Quad amplifiers and speakers when used as a conventional stereo pair, so the extra volume from the additional speakers was worthwhile. ‘The sound was subjectively louder, just as stereo seems louder than double mono. But the amplifiers/speakers still discharged [overloaded] on loud choral passages’. sound seemed better from outside the listening area, where it was easily possible to pick out a particular voice in the choir and listen to that line to the exclusion of the others. Inside the area, the tape hiss and drop-outs were very distracting. was predictably less good because of almost no ambience, but some Beatles tracks were surprisingly improved. A simple track such as Julia [from The Beatles, also known as The White Album, PCS 7067, 1968] sounded much more spacious, but complex tracks sounded muddled. Overall, on OUTRS recordings made with coincident figure-of-eight microphones, we were impressed by the generally realistic and spacious quality of reproduction, and the acoustic and ambience of the recording location were successfully captured. At first sight, it may seem impossible to reproduce stereo tapes or discs so that sounds appear to come from all around the listener. However, there is enough surplus information contained in many ordinary stereo signals for it to be possible to reproduce sounds from behind the listener as well as from each side and to the front of him. The article gives full details of how we set up the four speaker arrangement, and includes its shortcomings as well as its benefits. Particularly impressive were recordings of the choir walking on to the stage past the microphones, in which the footsteps of the performers passed from behind the listener, to his right, and then in front of him. There seems to be no doubt that the “sum-and-difference” four speaker reproduction technique for stereo gives a genuine all-round sound. He concludes, ‘The general success, on musical and natural recordings, of four-speaker reproduction of stereo indicates that properly recorded quadraphonic recordings should be something to really look forward to’. This experiment was a stimulus for Michael to move forward to a four channel set-up, which offered the prospect of a more realistic surround sound effect, and is described in the section on ‘Tetrahedral Recording’.